Free initial consultation ($295 Value). 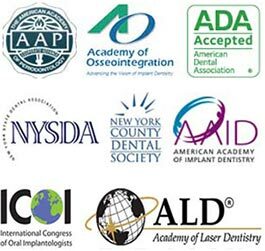 Our fees are based on the exceptional skill, time, judgment, professional care, and office environment provided by Dr. Navid Rahmani of NYC Dental Implants Center and the entire team. For your convenience, we accept cash, checks and most major credit cards; in addition, we can offer our patients several financing programs such as CareCredit, Wells Fargo advantage credit card program and more. With these plans, you will be able to select monthly payments that fit within your budget, turning the oral health you have always wanted into reality. We strive to continuously provide the best care available anywhere in the world on a daily basis regardless of insurance involvement. As a benefit to you, we submit all claims for patient reimbursement by assisting you in taking full advantage of your benefits so you can be properly reimbursed. In-Network Cigna PPO and Delta PPO.